My little Office Monkey is featured in an Etsy treasury today that it made up of objects that are patterned and yellow. Check it out! There are some really nice quilts actually - makes me want to get out my cottons and start some patchwork. A friend, and neighbour, has a sister who is due her first baby in July so she asked if I could knit a few cardigans for her, as she couldn't find any plain, unisex ones in the shops. So I finished it with short-ish sleeves for the summer and sewed on the buttons. I hadn't been able to get Emily to try it on for a photo, so yesterday we when were out buying fabric for dolly-making I let her pick out buttons for the cardigan herself. And she chose well - nice sparkly flowers. Lately Emily's teacher has been highlighting her emotional state, and how she gets very upset sometimes over small things. I'm sure that this can be a problem in class as it would be very disruptive. So, I've been down at the library reading books to try and find some solutions to try and fix it. At first I was looking at the topic of discipline, but then I found David Coleman's book 'Parenting is Child's Play'. A very insightful chapter in this book talks about emotional intelligence and how, as parents, how we handle our emotions affects our children. So it is with tears in my eyes that I realise, and admit, that the reason Emily cannot deal with her emotions is because, since becoming a mother, I have not been able to deal with mine. The change in my life has taken a long time to learn to deal with, and even still I struggle, and it pains me that I have passed my problems on to her. I've been watching Cupcake Wars on tv and getting very jealous of all the decoration. 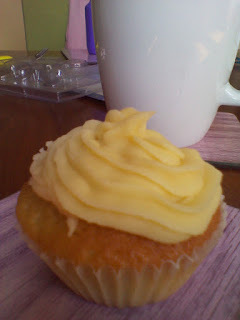 So i got out the piping bag I got for christmas but have been too scared to use,and bit the bullet,so to speak. By no means perfect but its a start! Although its pretty obvious what doll influence this pattern!! 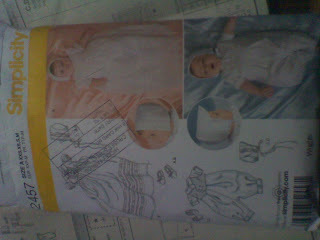 I only bought the pattern for the 13" Rag Doll on Wednesday. It was really quick to make. There was actually very little sewing for the body. I probably spent more time on the hair - which is not perfect, but will do. Emily was delighted to be given this doll - she's getting used to most things been kept for markets, etc! Love this little cardie, although it is only sized for quite small newborns. So glad to have this finished - and it turned out pretty well. The pin-tucks aren't perfect but I think they'll do! I'll be even gladder once its out of my house. I'm terrified of it getting dirty or damaged as there's no fabric left. Let's just hope it fits the little man now! From Jean Greenhowe's 'Mascot Dolls'. For a little 4-year-old who's obsessed with Fireman Sam. 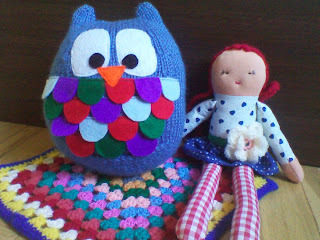 Emily got a few sewing projects as birthday presents - everyone must think she's a mini-me! One present was these two Kokeshi dolls from the Early Learning Centre. They were quite easy to do and the instructions were fairly alright. She likes them, but the fact that have the bits are stuck on rather than sewn on means I'm not sure how they'd hold up to any sort of actual playing. A little update on the christening gown I'm making for my friend. I can settle down to serious sewing after the kids have gone to bed, and last week was very busy with masses and prayer services, it being Holy week. However, I've gotten a fair bit done. I'm quite proud of all those pin-tucks. Just left is sewing on the collar, which is kinda puzzling me at the moment, and make buttonholes and sew on buttons. Need to Google how to finish the collar as the pattern sheet makes no sense. But for now, a glass of wine - I think I deserve it! i haven't had a serious sewing project in a while so i'm excited to get stuck into this - a christening gown for my friend's baby. rather than cut up her wedding dress, as the okd tradition goes, she's asked me to make it from her shawl.now for some sewing! 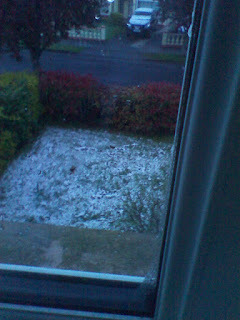 it was like summer last week in ireland.this week-snow! 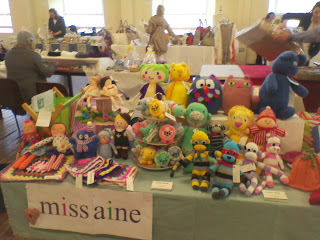 I've also set up a Facebook page for Miss Aine, the business. May as well get into the whole web-marketing thing! I'm also on Twitter for anyone who likes tweeting, although I'm quite new to that so it can get a bit hairy at times! just need to actually sell something now!